Key Players – Ricky Wilson – vocals. Andrew White – guitar. Simon Rix – bass. Nick Hodgson-drums, “Peanut”- keyboards. Overview – This is the debut album from the Leeds, West Yorkshire England band. The album sold moderately at first, but then started to garner some awards and would end up peaking at #2 almost a year later. Tracks were featured in popular video games and the band would win “Best Album” by NME a year later. FDF Comments (aka “the songs”) – The 12 track 44 minute album begins with “Every day I Love You Less and Less” and the band quickly sets the tone. It’s a punky/rocky fueled rumble of a track. Choppy vocals with punctuated drum strikes and chopping guitar chords. The song that pulled me in was “I Predict a Riot”. The sing along at the top of your lungs chorus is all that needs to be said. Click the link and prove me otherwise. “Modern Way” shows the band a little more laid back, letting the band fill in a bit more as Wilson eases back some on the urgency. We get back to the pop fun sensibilities in “Na Na Na Na Naa” and then switch to a keyboard drenched track “You Can Have It All” that finds the band in a laid back swing mood. “Oh My God” intros with a nice piano and solid bass section before the vocals come up. The track is interesting, but feels off in tempo just a little. After the intro you want it to be a bit more “driving”, but it’s a solid tune and then you realize come the chorus it’s perfectly paced. “Born to Be a Dancer” is another track that opens with a pretty piano before the drums set the tempo for another great poppy track and “Saturday Night” continues the back to back party. “What Did I Ever Give You”? is a little more laid back track, but what is nice is you get to really hear the band members shine and hear how competent they are (as expected), often that can be easily overlooked. The bass, the percussive fills etc all pull the track together nicely. The track also has what could be call the first “guitar solo” on the album. Despite the seemingly slow start “Time Honoured Tradition” gets to be a lot of fun with the build up to the chorus and the chorus itself, while “Caroline, Yes” slows it down again. Strong showcase for the band members and what each brings to the table. The album concludes with “Team Mate”, a song that, to these ears, never seems to get off the ground much and feels like a slight let down. Where are they now? – The band is still active, and largely intact. Hodgson left the band in 2012 to focus on other projects. He has teased by social media his new album is complete. 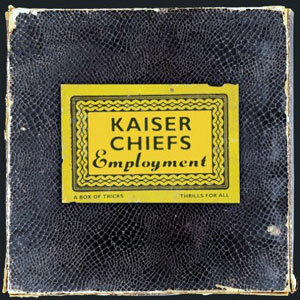 The Kaiser Chiefs released their last album (their sixth studio album) in October of 2016. FDF Overall Take/Was it worth Dusting Off? – There are some really fun tunes on this record. I bought it for one track I’ll admit, but ended up liking the bulk of it. What is interesting is I don’t own any of the bands other stuff, I guess I need to get cracking.